Google indexes billions upon billions of new content every day. Don’t spend time digging through online news outlets or Blogs. Have the news come to you as it happens. I recently read the following in a search engine trade journal: “A 26-year-old PhD student from the University of New South Wales has patented a new way of exploring the web that could revolutionize existing search engines. Developed by Ori Allon, the Orion© search engine is designed to compliment searches conducted Google, Yahoo or Bing search”. Back in September, SEW Forums moderator Edel “Orion” Garcia posted a thread about a new search technology under development. Wow, pretty cool tool. Think of the possibilities. You can set alerts for your name, stock quotes, web sites, news items, and unique information. 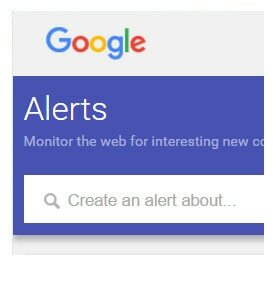 To set up your own Google Alert, first sign-up for a free Gmail account. Once you activate your free account go to http://www.google.com/alerts. Enter the topics or phrases you wish to monitor and watch the world wide web deliver it to your doorstep.